The Eden Child and Shower Commode is a versatile and convenient system designed to suit a wide range of children. Not only can it be used as a commode, it is built in a way that it can also be used as a shower chair. The padded seat is constructed of Polypropylene, which is chemical resistant, water resistant, and therefore more hygienic. As well as this, the fabrics on the chair are machine washable. 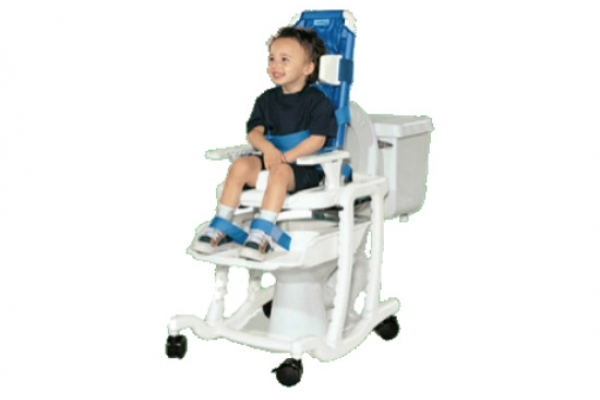 The seat is height adjustable, as well as a fully adjustable back in terms of height and angle. Despite all of this, it features a slim frame and a fold down seat and back, making it more compact and, as a result, much easier to store. Adjustable dimensions, versatility to compliment children of many different sizes. Frame accomodates small or large seat.